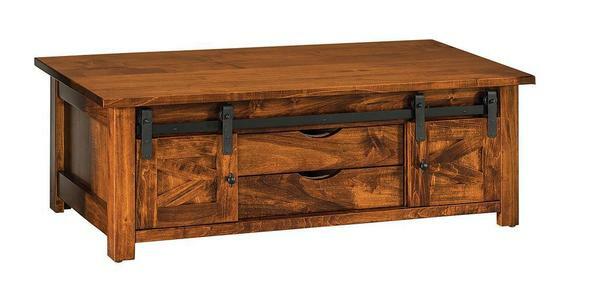 Our Amish Teton Coffee Table makes a rustic statement. This rectangular occasional is built standard with a 1-inch thick top, sliding barn doors with exterior barn door track system and open storage behind, two center drawers on 100 lb. side mount ball bearing slides, and a flat back. Shown in wormy maple with Mike's CF924 stain, this piece can be made from a variety of wood and finish options. Make this functional accent less or more rustic with the options you choose.